The Acer Aspire Nitro is one of the most approved gaming lines because it provides not only power and aggressive style, but also – an affordable price. Of course, this series does not target only gaming fans, as it provides configurations meant for those who need it for business tasks or heavy workload, demanding high computing capabilities. Today we shall have a look at a typical for this line model – Acer Aspire V15 which is not Nitro, but still features the latest 6th generation Intel CPUs and DDR4 RAM – enough to make it worth our while. Apart from these, you will find a latest NVIDIA series GPU – the GTX 950M. Even though an IPS panel is not present, we can’t wait to see what the V5-591G has to offer in terms of performance and quality. Apart from the laptop, the box also containes a power cable and a charger (in our case 135 Watts – PA-1131-16 model). The latest trend in the Aspire V15 line ensures that its models are easily recognizable. Nano-imprint lithography is what makes the construction of this laptop so stylish. It provides beauty and durability because of the aluminum integrated in the chassis. Our interest is further increased by this innovative feature. When looked at a different angle, the construction refracts light in an itneresting way and resembles a matrix. If you take a closer look, you will see interesting lines and dashes forming a fascinating pattern. Despite all this, the chassis can be covered with fingerprints relatively easy. Below the screen you will find a plastic panel that resembles aluminum. Upon it are placed the traditional stickers giving information about specifications. Between them is positioned the Precision Touchpad supporting several different gestures which allowed us to comfortably control our mobile device without any major difficulties. The keyboard makes typing very easy and comfortable for two main reasons. The first one is about the distance between the keys – 0.3mm, and the second one is the key travel – increased from 1.4mm (in previous models) to 1.6mm in the Acer Aspire V15. Above the NumPad section you can find an intriguing multifunctional button – the Power button. Even though you start the laptop by a single press, this is not the case when you want to turn it off. If you press it for up to 1.5 seconds, the laptop will not take any action becase Acer’s developers have taken into account the potential accidental pressing on your part. If you hold it between 1.5 and 4 seconds, the Acer Power Button app will appear on the screen offering several options – Sleep or Hibernate mode, or to be turned off. Press it for longer than 4 seconds and the V5-591G will be switched off without there being any pop up apps. The amazing keyboard and white backlighting, together with the Dolby Audio logo stand out against the black design of the laptop. We shall discuss the sound quality in the lines below. Taking a look at the sides we see that Acer offers some interesting ports, despite the relatively thin size (23.9 mm thicknes) and weight (2.4 kg). On the left, there are two USB 3.0 ports, an HDMI, VGA, Kensington Lock and Lan Ethernet ports. On the right, we see the charging port and a USB 2.0. One of the USB ports allows you to charge a smartphone, tablet or another mobile device, even when the Aspire V15 is turned off. 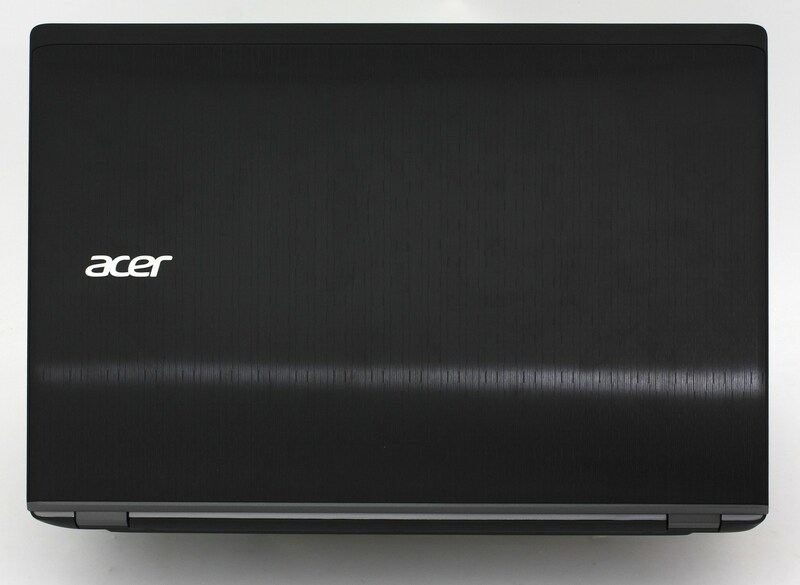 The Acer Aspire V15 (V5-591G) features a Full HD TN matte panel, whose model is N156HGE-EAL. Despite the lack of an IPS panel, Acer has incorporated a technology that resolves this detail. Its name is ColorBlast and is a great feature for the new models of this company. The V5-591G has twice as many colors as most other laptops in this price range. All this makes it a good solution if you are dealing with photo editing. In the lines below you will find our detailed analysis of the display. Its diagonal is 15.6″ (39.62 cm) and its resolution – 1920 x 1080 pixels. Additionally, the screen ratio is 16:9, the pixel density – 141 ppi, and the pixel pitch – 0.18 x 0.18 mm. The screen can be considered as “Retina” when viewed from a distance equal or greater than 61 cm (the eye cannot differentiate between the separate pixels from this distance, which is normal for looking at a laptop). The viewing angles are not exactly good. You can have a look at the image below. We measured a maximum brightness of 219 cd/m2 before calibration, with only 7% maximum deviation on the surface of the screen. The average value of the color temperature, measured on a white screen and maximum brightness, is 7300 K – cold, but not too much, day light (the optimal is 6500 K). To make sure we are on the same page, we would like to give you a little introduction of the sRGB color gamut and the Adobe RGB. Starting with the CIE 1976 Uniform Chromaticity Diagram that represents the visible specter of colors by the human eye giving you a better perception of the color gamut coverage and the color accuracy. Inside the black triangle, you will see the standard color gamut (sRGB) that has been used by millions of people in HDTV and on the web. As for the Adobe RGB, this is used by professional cameras, monitors and etc. for printing. The colors inside the black triangle are used by everyone and this is the essential part of the color quality and color accuracy of a mainstream notebook. The yellow triangle displays the V5-591G capabilities. The coverage is impressing meaning that the color saturation will be also impressive. Complete sRGB coverage! Below you will see practically the same image before and after calibration. Color circles represent the reference colors and white circles – the result. You can see main and additional colors with 50% and 100% saturation inside the sRGB gamut. The profile has been set to 140 cd/m2 and optimal white point – D65 (6500K). We used the X-Rite i1Display Pro as a tool for calibration. Below you can see the results from the accuracy color checker with 24 commonly used colors like light and dark human skin, blue sky, green grass, orange etc. Post-calibration color accuracy is high, avg DeltaE 2000 = 0.93. The contrast ratio is low – 335:1 before and 205:1 after calibration. Some of the colors from the report on the display test are presented in the below histogram. The Acer Aspire V15 (V5-591G) uses PWM for brightness control. The frequency is low and therefore aggressive for your eyesight – 200 Hz. To avoid this negative aspect, you will have to use the screen at maximum brightness (242 cd/m2). Acer Aspire V15 (V5-591G) comes with a high definition display with accurate and saturated colors. In fact, its accurateness is comparable to that of professional monitors, even though it is a TN panel. Furthermore, the sRGB coverage is completely covered, making this laptop suitable for photo editing. On the other hand, the viewing angles and contrast are limited. There is also a use of PWM which is not a negligible drawback, if you want to reduce the brightness of your display. Acer Aspire V15 (V5-591G) has a very good sound reproduction thanks to Dolby Digital Plus. In the different modes such as movie, music, game, you can fine tune thanks to an intelligent equalizer. The highs and lows are pleasant for listening and with almost unnoticable and rare deviations. Indeed, the sound quality is very good. Our model’s battery is 55944 mWh (56Wh), which is expected for a machine of this class (between the mid and high range). It has to feed the powerful Intel Core i7-6700HQ and GeForce GTX 950M GPU. As always, all tests we run include the same settings – Wi-Fi turned on, power saver switched on and screen brightness set to 120 cd/m2. Average battery results, as it was expected since the machine features a powerful CPU and the GTX 950M – 4 hours and 27 minutes. An interesting fact – the battery lasted for 14 minutes more, in comparison to Web browsing – 4 hours and 41 minutes. For accurate gaming simulation we use the Metro: Last Light benchmark with graphics settings set to minimum. It is definitely not a good idea to play while you are away from power supply. Despite this, the battery held up for almost two hours – 118 minutes which is a good result. Here you can see an approximate comparison between the CPUs that can be found in the Acer Aspire V15 (V5-591G) models on the market. This way you can decide for yourself which Acer Aspire V15 (V5-591G) model is the best bang for your buck. Fritz is a chess benchmark that tests the computing capabilities of the CPU with various chess moves. The Intel Core i7-6700HQ reached 12.440 million moves per second. By comparison, one of the most powerful PCs, Deep(er) Blue, was able to squeeze out 200 million moves per second. In 1997 Deep(er) Blue even beat the famous Garry Kasparov with 3.5 to 2.5. Here you can see an approximate comparison between the GPUs that can be found in the Acer Aspire V15 (V5-591G) models on the market. This way you can decide for yourself which Acer Aspire V15 (V5-591G) model is the best bang for your buck. This test can’t be a good representation of a real-life usage but it gives us a good grasp of how the system handles higher and longer workloads. Also, it gives us a hint about the stability of the system in the long run. As always, we start with a 100% stress test of the CPU alone. Almost instantly the temperatures reached 90 degrees Celsius in all cores, with the first core being the hottest throughout the entire CPU test. Unfortunately, due to the great heating the CPU used throttling, so that it may be cooled and not reach the 100 degrees maximum operational temperature. Throughout the 30 minutes of testing, the frequency remained around 3.0 GHz (100 MHz lower than the usual), which is a good result. Without stopping the CPU stress test, we launched a 100% load of the GPU. From the very beginning we noticed an increase in temperature, because the CPU and GPU are cooled by a single heat pipe. After 30 minutes of testing, two of the cores reached 100 degrees. This almost did not stop the CPU from working at relativley high frequencies, even though at times it ticked at 2.6 GHz. On the other hand, the GPU showed no weakness, despite having reached 80 degrees, and worked at the maximum 1124 MHz all the time. After an hour we stopped the GPU stress test and started a 15-minute benchmark to see how the GPU will perform, parallel to the 100% CPU load. The frame rate was not at all high – only 20, and the points – 1853. Immediately after the above benchmark we returned to the stress tests in order to completely exploit the cooling system and see how it performs in the exterior of the laptop. The hottest point we measured was in the lower keyboard area – 53 degrees, which does not cause discomfort when typing. Also, the palmrests remained cool. We were somewhat disappointed by the lack of an IPS panel. Forutnatelly, the ColorBlast TN panel covers the entire sRGB color gamut, and the colors are accurate and saturated. The presence of PWM is unpleasant, but can be avoided by setting your brightness to 100%. Great reviews… shame about the PWM, I don’t suppose there’s a comparable laptop without it?